When you host gatherings at your home, do you drag your alcohol and drink mixing supplies out of a cabinet only to haul them all back after the festivities? When you stage your party on a level of the house different from your liquor cabinet location, do you carefully negotiate staircases while laden with your heavy bottles of liquor? If so, then you need to acquire some bars for the home, and not just ordinary, ho-hum bars. Rather than a stationary bar that lives in one room waiting for guests to find it, you can buy a portable bar that can roll to the heart of the fun. Built to your specifications, a bar on casters with sturdy shelving below the counter can hold your supplies while you guide it to the best spot to set up and serve. On the main level, you can situate your cocktail dispensary near the kitchen or out on the deck. In the basement, your moveable bar can stand anywhere it’s convenient or moved to the walk-out patio or poolside. Afterwards, it can live in its dedicated home until the next big event. Mobility is great, but it gets better. You can now acquire portable bars infused with light from the inside out. A steel frame clad in acrylic and impregnated with LED light strips easily becomes the focal point of any celebration. Fed by hidden battery packs, your clever bars contribute a pleasant glow to the scene at any intensity you choose. Plus, you can program the LEDs to rotate custom colors and even “dance” to your music. With easy-to-use remote programmers, you totally control the light show. Your guests will love how your bars add to the entertainment. So, bring your liquor out of the closet and roll it to the center of the fun with brilliant, dynamic bars for the home. The atmosphere in your bar or nightclub makes all the difference. It can distinguish your business as the destination spot or the place that merely serves your competitor’s spillover crowd. Of course, arranging your light fixtures and furniture to maximize illumination in a subdued evening milieu takes some planning. But what if your furniture and lighting were the same thing? With LED lighted furniture, you combine the two elements of success into one. 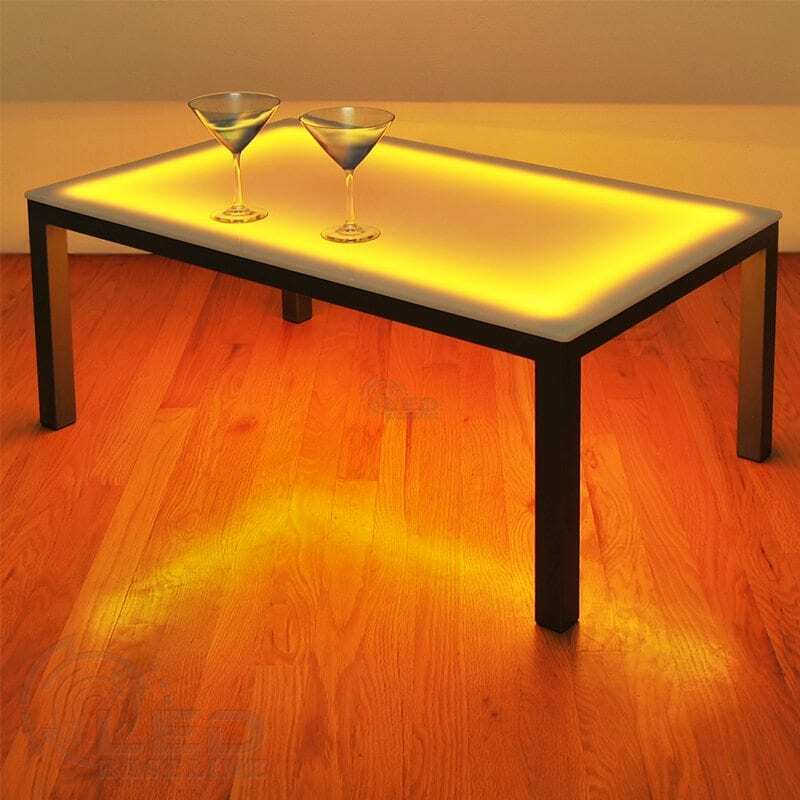 Futuristic lighted furniture offers a warm, inviting glow that will captivate your patrons. Designed to illuminate the drinks and decorations above, these unique pieces practically eliminate the need for overhead spotlighting or wall fixtures. The soft glow of colors surrounds the tables with no harsh glares to disrupt the ambiance. You can place your tables anywhere in your establishment, and the needed light goes with them. 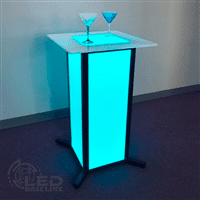 To further enchant your guests, the LED light strings in your furniture can rotate from color to color according to a pattern you design and control. You can create a multitude of color combinations to fade in and out at a rate you determine. Your guests will relish the soft radiance and ever changing movement of light. No matter the size or style of your club, lighted furniture comes in either pre-fabricated styles or built-to-order custom designs to perfectly elevate the elegance of your space. To round out the appealing array of lighted tables, you can add a lighted bar and shelves, as well. A mix of short tables with tall boys will add interest to your furniture arrangements. Truly, you can customize your interior design to be like no other in town. Naturally, all of these lighted furnishings also fit well into any home bar, too. Commercial ventures and homeowners alike can make the most out of LED lighted tables, bars and shelves. Crafting the perfect atmosphere in a bar, gallery, nightclub or home entertainment zone is easy when your furniture itself provides intimate lighting.